WAUSAU – The Marshfield wrestling team fell short of its season goal of repeating as the Wisconsin Valley Conference champions. But the Tigers’ dream to compete for a state championship remains alive. Marshfield won 11 of the 14 weights – six by pin – in a 54-18 win over River Falls on Wednesday in a WIAA Division 1 team sectional final at Wausau East High School. The Tigers, who finished second to Wisconsin Rapids in the WVC, earned a second-straight trip to the state tournament and the fourth in the program’s history. Seedings for the eight-team Division 1 field will be announced on Feb. 23 and the state tournament quarterfinals are set for March 1 at the University of Wisconsin Fieldhouse. The Tigers fell to Stoughton in an opening-round state matchup last year. Shane Westerhausen (120), Caden Dennee (132), Ryan Dolezal (138), Caden Pearce (152), Schwanebeck-Ostermann (182) and Sam Mitchell (195) all had pins for Marshfield. The Tigers’ Gabe Pugh scored a technical fall in his matchup at 126 pounds. Just four of the weights in the dual went the full six minutes. 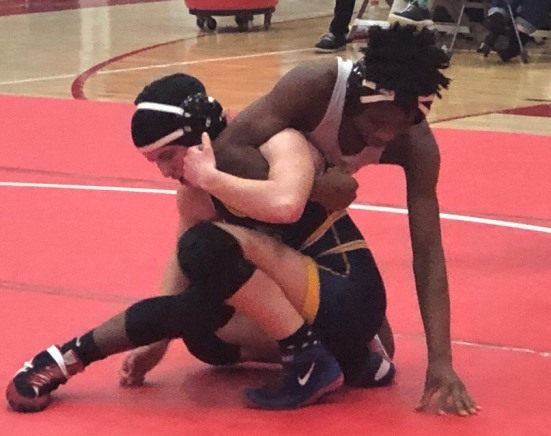 A swing match in the meet came at 106 pounds as Marshfield’s Sirius Conrad earned a comeback 3-2 decision over Josie Bartishofski, who became the first girl in the state’s history to win a regional title last week. Conrad tied the match on a reversal late in the second period and Bartishofski allowed Conrad an escape to open the third. The freshman held on to the lead for the rest of regulation to give Marshfield a key win after River Falls had gained momentum after back-to-back pins by Tyler Kliszcz and Garnett Ripley. Conrad’s win gave Marshfield a 25-18 lead after eight weights and the Tigers won the next six matchups after that to close out the victory. 152: Caden Pearce (M) pinned Leyton Hadzima, 3:37. 160: Nathan Fuller (RF) pin Brenden Braund, 1:55. 170: Nolan Hertel (M) won major dec. over Garrett Borth, 14-5. 182: Bentley Schwanebeck-Ostermann (M) pinned Austin Mueller, 1:14. 195: Sam Mitchell (M) pinned Marcus Cudd, 0:35. 220: Tyler Kliszcz (RF) pinned Cameron Hergert, 1:21. 285: Garnett Ripley (RF) pinned Sam Haessly, 2:00. 106: Sirius Conrad (M) def. Josie Bartishofski, 3-2. 113: Kegan Cliver (M) def. James Hampton, 6-2. 120: Shane Westerhausen (M) pinned Owen Larson, 1:29. 126: Gabe Pugh (M) won by technical fall over Bennett Cernohous, 17-1. 132: Caden Dennee (M) pinned Miles Longsdorf, 2:23. 138: Ryan Dolezal (M) pinned Cooper Andrea, 2:58.